1. Exercise wheels. Exercise wheels are inarguably a must-have for gerbils, which can run a grueling five miles a day! These gerbil-home staples are an integral part of gerbils care because those tiny mammals have a lot of nervous energy and must exercise daily. 2. Run-about-balls. 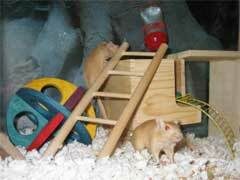 Another great way for gerbils to get their required exercise, run-about-balls are an exercise wheel alternative that they can use outside the cage. Just remember that these gerbil toys require supervision. 3. Tunnels and holes. Gerbils get a lot of amusement out of going through holes and running through tunnels. Luckily, many of the plastic gerbil cages are built with this in mind and come in a variety of shapes and sizes, and feature a whimsical array of twisted tunnels. 4. Chew toys. Gerbils love to chew and gnaw on things, so provide them with some soft wood blocks, or even with cardboard toilet tissue rolls. You won’t find cheaper gerbil toys! Remember that chewing is important to gerbil oral health, so it’d be worth it to also invest in some rubber chew toys. 5. Dust baths. Sure, dust is not a toy, but don’t tell your pet gerbil. Bath sand can be bought at any pet store, and simply requires you to fill a bowl and watch your pet play. These are the five best ideas for treating your pet gerbils to some great amusement, physical exercise, and mental stimulation. Delight in your frisky friend’s delight the next time you introduce these into your pet’s playtime routine.